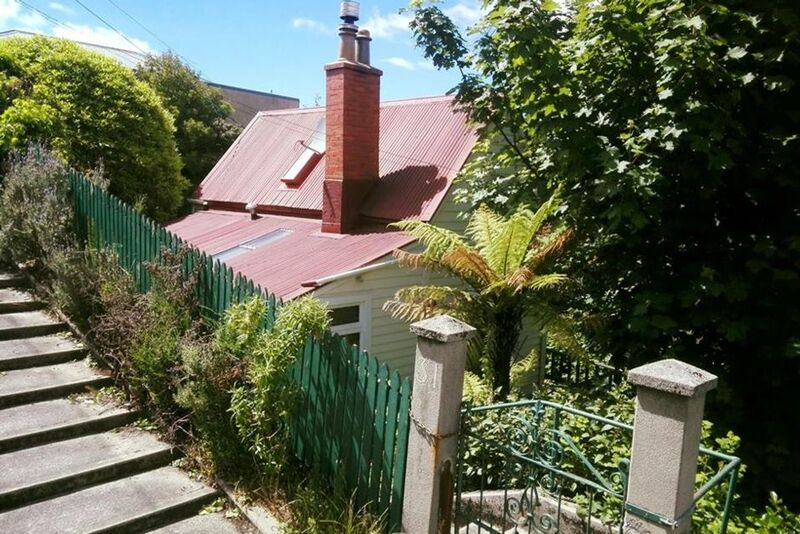 Canongate Cottage is in central Dunedin, just 10 minutes walk to the Octagon. Built in the 1860's, this simple yet delightfully charming cottage is unique and cosy thanks to the wood burner. Traditional 'two up and two down', with a kitchen and bathroom in the 'lean-to'. There are two upstairs bedrooms, one with queen size bed, the other with two king singles. Please note; bedroom access is via a steep staircase! This makes the cottage unsuitable for children and less mobile people. A 10 minute walk to the Octagon takes you past the famous Speights Brewery, cafes, bars, restaurants, movie theatres and galleries. There is a private garden with a view out to the ocean and harbour in the distance. No off street parking available. Due to its proximity to town parking can be tricky during work hours, from 4pm week days and during the weekend parking shouldn't be a problem. The cottage was so cozy and charming. It provided a wonderful place to recharge after all of the rushing around NZ we had been doing. This was our favorite place we stayed in our 2 week vacation. Great little touches everywhere made this feel like our tiny home to settle into. Many thanks to the owners! Lovely cosy comfortable character cottage in great location. Easy walk to town centre and lots of great places to eat. Cottage was well equipped. We’d love to come back and would recommend. Great spot close to the city centre of Dunedin. Cosy, rustic and everything present for a perfect stay. Highly recommended! We loved our stay in this little cottage. It's full of charm and character, the wifi was good, and it was sufficiently well-equipped and comfortable to keep us happy there for a month. It's a short, though steep, walk into the centre of town. Parking was a bit of an issue but should be easier once the road works have finished. Amazing cottage, very cute and comfortable. Highly recommended- everything has been thought of- very well equipped little cottage! I thoroughly enjoyed staying at Canongate - although small, it was very well appointed. I loved the tiny spaces upstairs (including a lovely view to the harbour), and the downstairs spaces were surprisingly large. There were also a couple of lovely outdoor spaces to enjoy, if I'd had more time. The hosts were friendly, highly responsive to queries and left good breakfast provisions and visitor information. I highly recommend a stay at Canongate, although the stairs might be tricky for those unsure on their feet.